We always like to share reports from other news sources so that you have multiple angles on the issues affecting Zambia. We aim to encourage debate and action not indoctrinate our views. See below on what Bloomberg reported on the Kwacha today. Zambia’s kwacha retreated to a record low against the dollar, depreciating more than any other currency in the world this month, as lower copper prices and a tax dispute with mines curbed foreign-exchange supply. The currency of Africa’s second-largest producer of the metal, used for electrical wire and water pipes, weakened as much as 2.3 percent, the biggest slide in two months, to 7.035 per dollar. The kwacha was trading at 6.9610 as of 2:03 p.m. in Lusaka, the capital. That extended losses in May to 9.4 percent. Former Ivorian President Laurent Gbagbo has disclosed Joyce Banda is his long lost sister. Confirming the development, Hosni Mubarak, their paternal uncle said the whole family had been searching for their long lost sister since the fall of their maternal grandfather Idi Amin Dada in 1979. Meanwhile family spokesperson Robert Mugabe says it's a joyous occasion for the family to finally have one of their one and only sister back home. Mugabe said Joyce is definitely their sister. "She definitely has the traits of father. Our father would have been proud of her", Mugabe remarked! 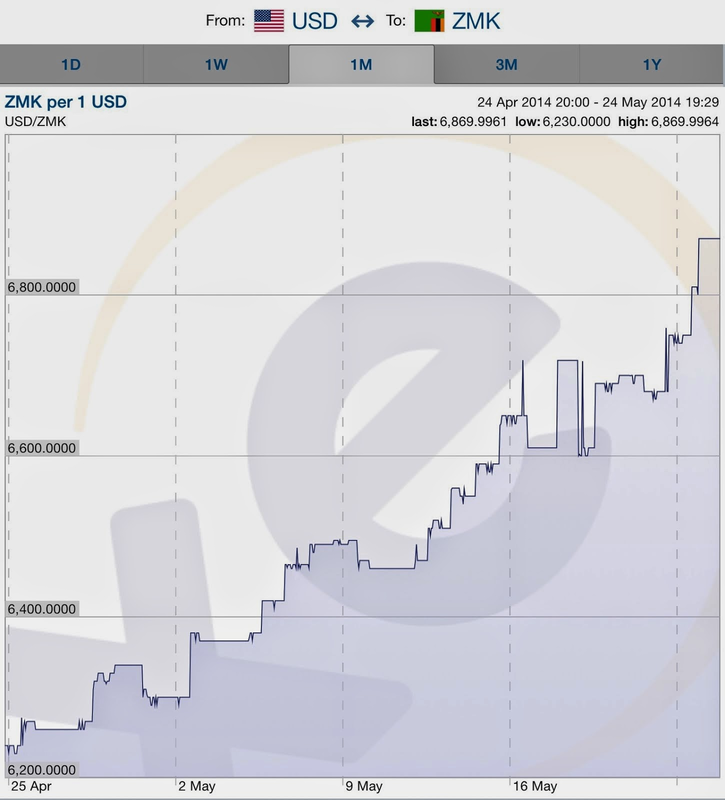 There are some readers who appeared to be in disbelief that the Kwacha is at K6.9 per $1. 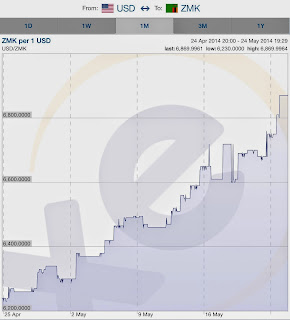 The rapid fall of the Kwacha is clearly shown in the chart below (click for clarity). The rapid fall of the Kwacha has puzzled many people. But if you are a follower of Zambian Economist this was all predicted. Indeed, in our strident opposition to the abolition of SI 55, when everyone was praising the move, we made it clear that abolishing SI55 would only make things WORSE not better. President Sata this week made a much publicised court appearance in the case he has brought against Richard Sakala and the Daily Nation. This is the first time a sitting president has testified in a court case and opened himself up to the possibility of brutal cross examination. President Sata is suing the Daily Nation over an article they published on 16 May 2012, in which the author Choolwe Beyani suggested that President Sata had ordered the Development Bank of Zambia (DBZ) to fire its lawyers, Vincent Malambo and Company, to protect his friends Fred M’membe and Mutembo and Nchima Nchito from paying back K14 million to the DBZ. Chipata Municipal Council has conceded defeat in its effort to control the sale of the infamous alcoholic sachets popularly known as Tujilijili. Despite being banned Tujilijili continues to pour in Chipata largely due to the porous between Zambia and Malawi. Local traders have "vowed not to stop the sale of the illegal products" (Source: Times, MuviTV). In 2012, GRZ banned the manufacture and sale of Tujilijili. But as expected, the ban has not been enforced in many councils, due to lack of capacity and competing problems. What has happened is that imports have gone up! Anil Agarwal: “Seven to eight years back, hunger remains to do big work. Pondering what to do... how can we let life go in vain? I saw it in the paper FT [Financial Times]; there was largest copper mine in Africa. That copper mine was up for sale. That government was privatising it. I got quite interested in it. I have a friend in McKinsey – [MD in India] Ranjit Pandit. I went to him, asked him to make papers. The story of ZAWA is a shocking one. In 2012 Tourism Minister Sylvia Masebo fired the ZAWA management for alleged corrupt practices in awarding Safari hunting concessions. Ms Masebo claimed said ZAWA had awarded hunting concessions to a family cartel, among others, which had significant potential to promote money laundering. That fired ZAWA board was constituted in April 2012 by Minister Given Lubinda. Only to be fired in August 2012 by new Minister Sylvia Masebo. Masebo then appointed a new team led by mostly her close friends like Wynter Kabimba and Guy Robinson. That new ZAWA board hired a new management to run ZAWA. A board and a management many now accept were equally corrupt. The Kwacha has been relatively stable in the last few years. However in 2013, the Kwacha was characterised by a depreciating trend against most major trade partner currencies, except the rand. The Kwacha depreciated against the US Dollar by 4.9% to an annual average of K5.39/US$ from K5.14/US$. Similarly, the Kwacha depreciated against the Pound Sterling and Euro by 3.6% and 8.3%, respectively. Two graphs that tell the story of how the Kwacha has performed since PF came to power. I thought rather than write long piece these graphs would be sufficient to paint the picture. CEO Mubanga Mwiko says the available funds for the public service loan scheme in 2014 is K107m of which K100m is the budget provision for the year and K7m are carry-over funds from 2013. The PSMFC recently hinted that all employees of of quasi-government institutions may soon be eligible to access the subsidised loans. Government wants to "shield public servants from unfavourable lending rates". Editor's note: This is a guest post by Henry Kyambalesa, a resident contributor to Zambian Economist. He is a Zambian academic currently residing in Colorado, USA. The articles argues that violence has become part of Zambia's political DNA. In a recent article entitled "Kabimba Advises PF Members, Officials to Avoid Violence," which appeared in The Post Newspaper of 28th April 2014, Comrade Wynter Kabimba is quoted as having advised Patriotic Front (PF) members and leaders to avoid violence because the country "can go into flames if violence becomes part of our political culture."